how an additional lane would serve local traffic. Whether any of the changes proposed for Interstate 5 at the Santiam and Knox Butte interchanges in Albany ever get built is an open question. Still, the Albany City Council does not like some of the details and would like them at least looked at some more, and preferably changed, before they become part of any settled plans. Amy Ramsdell, area manager for the Oregon Department of Transportation, says new on- and off-ramps and related street changes at the Knox Butte and Santiam interchanges would likely cost upwards of $400 million in today’s dollars. They’re being planned to be built in 20 to 25 years. But they could be built in stages, starting with a new southbound on-ramp at the Knox Butte interchange. 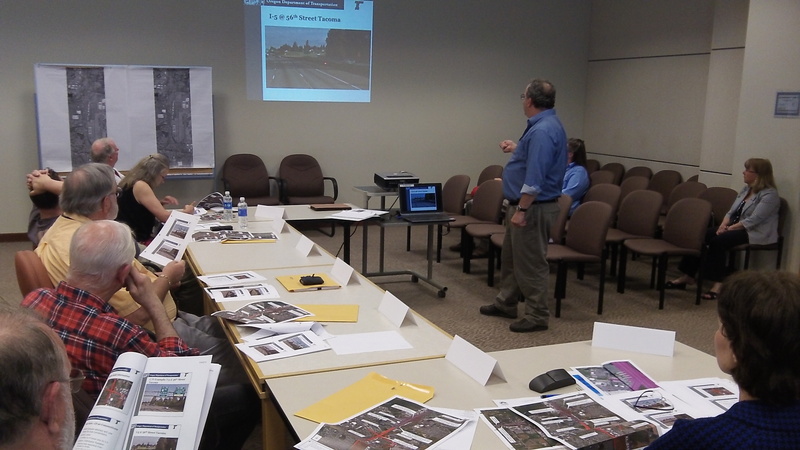 ODOT has been working off and on since 2006 pinpointing existing and future deficiencies in the freeway and related streets from Santiam Highway north and proposing ways to fix them. Much of this work has been part of an environmental assessment to see if a full-blown environmental impact statement is necessary under federal law. The conclusion so far: An EIS is not needed. Before long, ODOT plans to schedule public hearings on what’s being proposed. — The proposed treatment of Airport Road, the southern end of which would no longer reach Santiam Highway. It is to be cut off as a cul-de-sac or extended westward through the south side of a trailer park to Bain Street. Councilor Floyd Collins questioned how fire trucks from the station east of I-5 would reach the neighborhood without Airport Road. — The idea that Fescue Street — the access to a hotel and Home Depot, among other places — would become a one-way street south. To get out of the area again, drivers would have to head east to make a left on Timber Street. — A Knox Butte northbound on-ramp and southbound off-ramp with side-by-side entrance and exit on Knox Butte. Despite signs, drivers might mistake the off-ramp for an on-ramp and end up going the wrong way on the freeway. That’s the situation now on Santiam, and at least one wrong-way incident occurred in recent years. — The possibility shown on project maps that both Price Street and Commercial Way on Santiam would allow no one to make left turns into them from the west. If that stays in the plans, said Councilor Rich Kellum, all the business properties on those streets including his own would lose some of their value. Getting to Timber Linn Park would be harder, too. “No way,” Mayor Sharon Konopa said of that change. Other changes that got less comment include a proposed local bypass lane from Knox Butte south to Santiam to accommodate local traffic, as well as a new southbound off-ramp at Santiam. It is this off-ramp that would displace the south part of Airport Road, which now parallels the freeway.